I tried all the methods that I can find online and I even dove into the python code it didn't help. The version return by the code in msvc9compiler.py shows my VS version is 14.0 and I dive into all kinds of windows registry to add a couple of entries(VC and ProdctDir to point to the VS 2008 VC folder). It didn't help. I can run vcvarsall.bat from the command line and it runs fine with following result. Setting environment for using Microsoft Visual Studio 2008 x86 tools. I though it works fine. Is there anything else I can try? I have spent two days on this. according to this : https://www.python.org/downloads/release/python-350a1/ python 3.5 is compiled with vs2015. 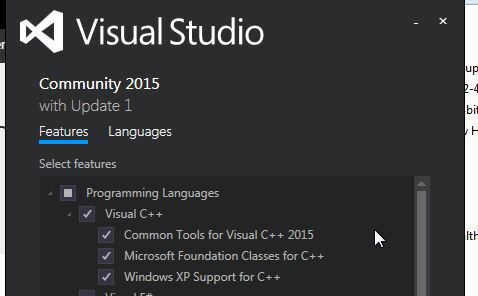 Re-install or upgrade Visual Studio 2015 Community and make sure you select Visual C++ then proceed. It worked for me on Windows 7 64bit with Python 3.5.1 which I installed as part of WinPython 3.5.1.2 64bit. Not the answer you're looking for? Browse other questions tagged python install or ask your own question.